Aviation student Carson Blaisdell has many reasons to attend Bowling Green State University. They include a “family-like environment,” small class sizes, a brand new fleet of aircraft, an on-campus airport and a family connection to Amelia Earhart. 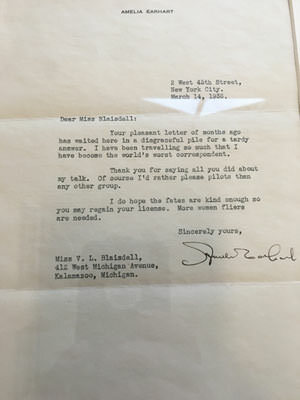 Blaisdell’s great-great aunt Velva Blaisdell was friends with Earhart, and his family has the correspondence to prove it. 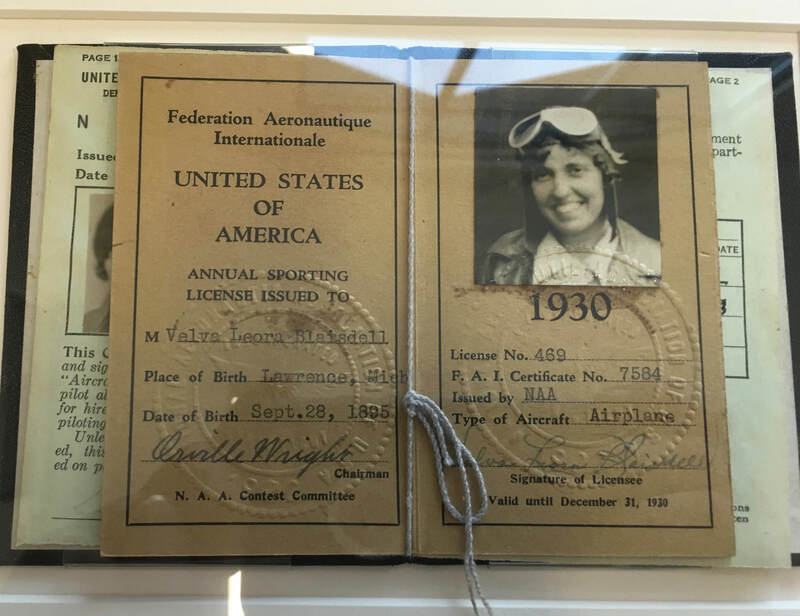 The BG Flight Center is displaying one of the letters from Earhart, as well as Velva Blaisdell’s recreational pilot’s license from 1930, until the end of spring 2017. 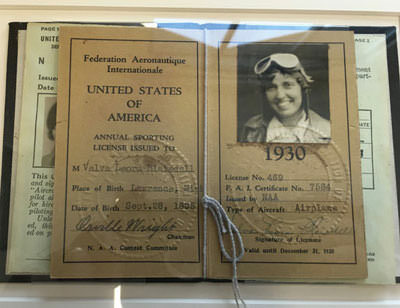 The license is signed by no other than Orville Wright, who was the chairman of the National Aviation Authority, the predecessor of the Federal Aviation Administration. Dear Miss Blaisdell: Your pleasant letter of months has waited here in a disgraceful pile for a tardy answer. I have been travelling so much that I have become the world’s worst correspondent. Through research, the Blaisdell family, which resides in Sylvania, Ohio, found out that their ancestor went to flight school around the same time as Earhart. Blaisdell wanted to be a pilot ever since he was 4 years old. 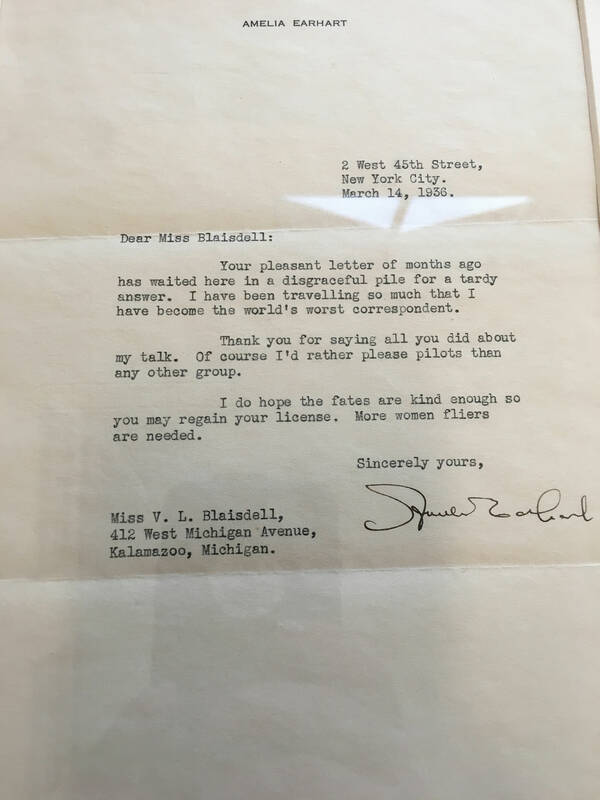 When looking into collegiate aviation programs, Blaisdell considered Ohio State University, but decided BGSU had more to offer. Because they’ve kept the priceless artifacts in the family, Blaisdell said they don’t get the attention they deserve. However, he thought a display at the BG Flight Center would a nice place to land for the time being. As far as career aspirations go, Blaisdell said it’s a good time to be in aviation school because there is a shortage of commercial pilots.